More bugs from the property! 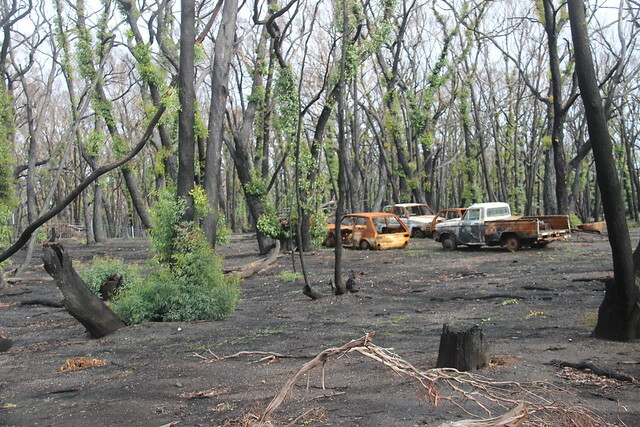 Just before Christmas, 2015, the property was hit by bushfire. Since then, I’ve been documenting the recovery and how the environment is responding. This post shows what the property looked like the week following the fire. It was quite confronting. The cars we had all learned to drive in were burned. The shed and gazebo where we sat on many winter nights were flattened. There were some animal carcasses. There was no life, no greenery. Until we got to one of the neighbours, whose fields were still green. During this visit, I tried to take more creative photos to show the destruction. We did see an echidna and kangaroo, which was reassuring. A week after the previous visit. I was surprised to still find skinks. We found a healthy ant nest near the dam – so naturally I took a lot of photos. This was the main nest we saw. This was taken a couple of weeks later. Ants were starting to return and I saw a decent amount of birdlife. I didn’t see as many birds for quite some time. I may have done the same title twice! Things were starting to get exciting. We saw trees starting to get regrowth in places, especially around the dam. Insects were starting to return. We also got a new fence thanks to Blaze Aid which did so much for morale. We were getting more and more regrowth. It was growing about a foot out from the trees in some places and in others, growing independent of any trees. This visit, I showed the regrowth in a winder context. You can see the green up to the top of some trees and we were starting to be able to tell which trees had definitely died. I didn’t have the change to return here for a couple of months. The absence meant that there was a significant contrast between visits. My parents had cleaned up the wreckage from the shed. There was a lot of groundcover returning and a couple of specimens of fungi. After 6 long months we were finally starting to see groundcover returning. Grass and sundew were popping up in their previous haunts. There was alsoan increase in bird activity; especially the first sighting of a wedgie! May was unseasonably warm. As the cooler weather hit, we noticed a lot more fungi around. We’ve been making an effort to document this, although I’m struggling with ID’ing. We finally got someone in to help with the cleanup. It was a bit of a shock seeing it compared to what it was like before. The tractor knocked over some of the fungi. It forced us to look harder to find interesting specimens and we found some new types.